The newest version of EdiBot relies on contour finding in OpenCV to locate and chase yellow objects. Instead of competing this year in AVC, I created an interactive demo for the Engineers' Lounge. OK, by "created," I mean "updated." The original EdiBot was made to show off the power of the Intel® Edison, and I made a few adjustments for EdiBot 2.0. The idea behind EdiBot is simple: have a robot chase down the largest object of a single color in its field of view. To do that, I used the popular computer vision library, OpenCV. This is a good opportunity to talk about how I used OpenCV (in Python) to find blobs of saturated color. Note that much of this is based on the ball tracking code from Adrian Rosebrock's blog. If the process says you need additional dependencies, check here. 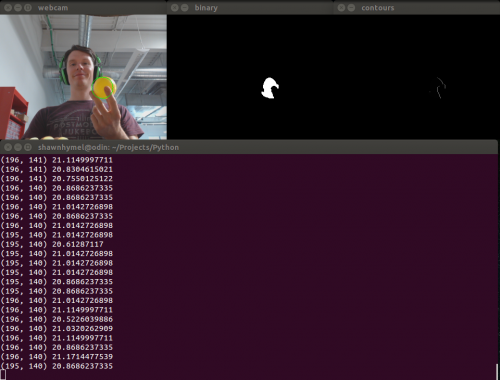 print "Camera initialized: (" + str(camWidth) + ", " + str(camHeight) + ")"
Plug in a webcam, run the code in Python, and you should see three windows appear showing the different stages of image processing (note that the windows might be covering each other). The largest yellow object that appears will have its x, y coordinates and size (radius) printed in the console. Note that we first blur the image, which helps reduce noise. We then convert the entire image to HSV (Hue Saturation Value) color model so we can filter it on the next line. We call the inRange() function with low and high HSV thresholds. Anything between these thresholds (dark orange-yellow to bright pale green) is converted to a white pixel. Everything else is converted to a black pixel. We then perform another filtering known as "dilation." This makes all the bright (white) areas larger and has the effect of removing more noise and combining disjointed white regions close to each other. This white/black "binary bitmap" is shown in the "binary" image window. 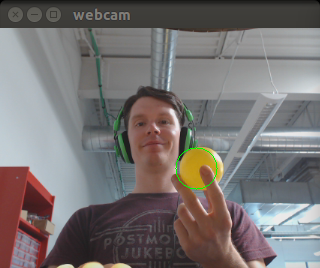 After we get a binary bitmap, we call the pseudo-magical findContours() function where OpenCV finds the edges of objects (i.e., the outline) in the image. Since we only have two colors, black and white, finding the edges should be an easy task. With the largest contour, we find the smallest circle that completely encloses it and find the center of mass based on the moments of the contour. We now know the x, y and radius of our object! In EdiBot, we figure out which third of the screen it is on and turn to face it. If the radius is too small, drive forward, and if it's too big, back up. The original EdiBot was on its last leg (wheel?) after three Maker Faires, and I figured it was time for an update. First and foremost, it received a complete chassis overhaul, and I replaced the Rover5 driver board (retired) and Edison Arduino Block with the Edison H-Bridge Block. The code was also updated with the new tracking code above, which no longer relied on SimpleCV. If you want to build your own EdiBot 2.0, full instructions can be found on Hackster. I have been a big fan of you and of Adrian Rosebrock for sometime. I am glad to see that you know of him, his course in computer vision is really worth the little money he is asking for it. I hope that at some future date you might want to contact him and tell him about this project, he might just include in his blog. That sounds like a good idea, thanks :) I did learn a lot from his blog. So you're running Python scripts on the Edison? Yup. The Edison is running full Linux, so you can use just about any language you want. I initially wanted to use Node.js for this project, but I couldn't find any good wrappers for OpenCV. Excellent article! It was nice talking to you at the AVC. Hope you get an opportunity to try Flask at some point. It's good stuff! Thanks, and it was good chatting with you, too. I definitely plan to look into Flask. Hey Shawn, what was the video resolution and the FPS it worked at? T³: Building a battery backup Pokédex for Pokémon Go!